Colin Marshall sits down in Nakatsu, Osaka, Japan with guitarmaker Josh Parkin proprietor of Josh Parkin Guitars. 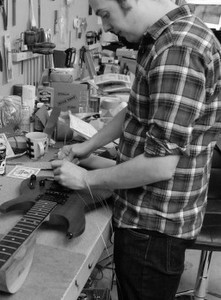 They discuss how the intensity of Japanese enthusiasm extends to guitar-playing; how Japanese friends in London urged him not to set up shop in Tokyo, but in Osaka; his early life in Yorkshire, “the English Kansai,” where he made his first attempts to build and modify guitars; the importance of finding the best handmade pickups and of learning to see the difference between .2 and .3 millimeters; the excellence of Japanese manufacturing, and its somewhat less impressive mastery of anthropometrics; his working life on Denmark Street, the center of London guitarmaking, and why he decided not to open his own business there; his travels through Asia before moving to Japan, which began in India and eventually found him homeless in Beijing; what it takes for a foreigner to open a business in Osaka (besides a few years off that foreigner’s life); the impossibility of finding a decent banger in Japan; his dissatisfaction with the usual foreigner’s job of teaching English, because it wasn’t making guitars; his work with Tim Olive and experience of the Japanese noise scene, which seems to spring from within the culture rather than interpreting traditions outside it; the way everything in Japan gets easier after six months, except perhaps dealing with the ward office; Japanese-style obsessive drive as a necessity of guitarmaking, no matter where you do it; and his dream job of building a guitar according only to the player’s musical style. This was written by Colin Marshall. Posted on Saturday, January 19, 2013, at 5:30 pm. Filed under Japan, Notebook on Cities and Culture. Bookmark the permalink. Follow comments here with the RSS feed. Post a comment or leave a trackback.